Add the oil to a large skillet over medium heat. When oil is warm, add the onion, mushrooms and poblano pepper and cook until the mushroom "water" has evaporated and the vegetables soften. Add the garlic, spices (cumin through pepper), and cilantro cooking a minute or two until very fragrant. Cut quesadillas in half and serve with your favorite garnishes and toppings... avocado, guacamole, sour cream, salsa and additional cilantro if desired. Liv Life Note: A handful of cooked chicken would be a wonderful addition to the quesadillas (as Ellie wrote the original recipe). My husband fully enjoyed the amount of spices in the mixture, however I found the amounts to be a bit strong. Adjust or not, according to your tastes. Liv Life Note 2: This versatile recipe is one of those where one can substitute what works for them and what they have on hand. Don't like onion much? Add less or eliminate it all together. Love cilantro? Add more. etc. Be creative and enjoy! Ok, I know I should be commenting on the dish itself, but I'm not sure I'll be able to get past: "he rolled up his sleeves and actually started on the dishes..." Seriously?? I need to make these to see if that'll happen in my kitchen. Clean-up is usually guilt-inspired by me towards the others. This must really taste as good as it looks! My guy isn't a fan of meatless meals either but I sneak them in whenever I can! These look so yummy!! LOL @ the first line of the post... Glad the book survived! This is my kind of food... I love the ingredients & flavors you've used, Kim! I think I would love this for breakfast, lunch or dinner! :) Thanks for sharing! Actions do speak louder than words! My husband does not really say much and I have to press him for his opinion. Your description as well as picture tells me that these quesadillas ares a winner. I may not be able to do the dishes, but at least I can vote-Buzz buzz! have a great day! These look great especially coz I love mushrooms. Would love to try them. 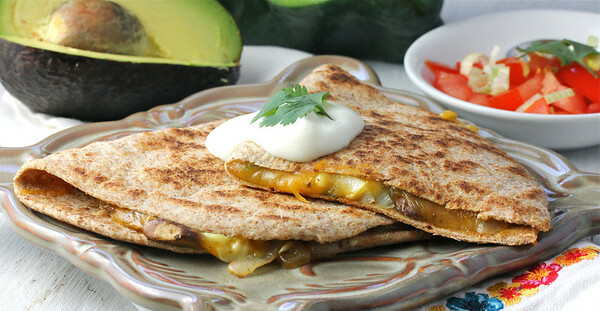 I love quesadillas, and my hubby likes mushrooms, so ocassionally we have meatless meals . I have to try these. We have a rule, sort of, whoever cooks, then the other person cleans up. It works pretty well. Glad that your cookbook survived! Honestly, I love cookbooks that show their use and love...whether it comes from the kitchen or the bathtub :) This quesadilla looks fantastic! that looks like a great quesadilla! 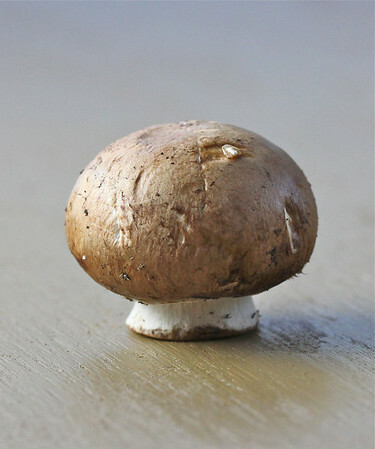 i love the addition of mushrooms! This looks and sounds SOOO amazing! Unfortunately Patrick is a big hater of all things mushroom. HUGE bummer. I want to try these so bad though. Maybe I will just omit the mushrooms in his and leave the peppers in. He can deal with it right?! Have a great weekend and I cannot wait to see Liv's video! 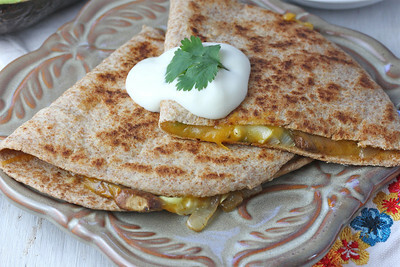 What an excellent idea to have mushrooms in a quesadillas :) I'll have to try that! 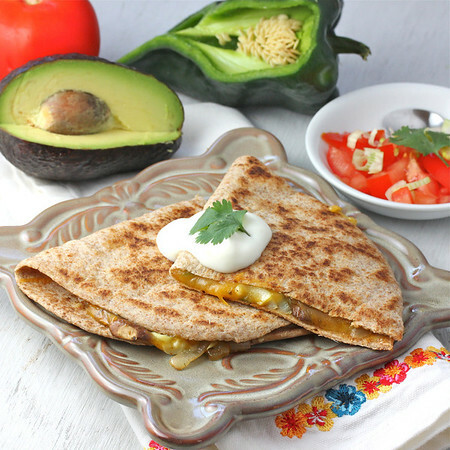 Quesadillas are so wonderful and I love the poblano addition!! Buzz buzz! Mushrooms and poblano together- delish! This quesadilla looks so tasty. I don't blame for wanting to keep going with this recipe, even after it went for a bath! It looks delish! You had me at poblano... my personal favorite pepper! I had quesadillas last night and hubs had tacos with lots of mushrooms. I didn't have poblanos but I bet they would have made my version better. Was using up leftovers from the fridge. Looking at your pictures, I think I might have to have another for lunch! Oh I love every ingredient! A perfect way to spice up the last remaining meatless fridays for lent. It starts to get a little boring by the end. This looks so extremely yummie!! !